Fire events in electroplating facilities have been occurring more often in recent years than in the past, incurring serious damages. In addition to material damage due to fire and explosions in these facilities, contaminated extinguishing water and leaking chemicals can also harm the environment. Combined with consequent business interruption, the fires can lead to substantial losses for manufacturers – and insurers. Electroplating (also known as galvanizing, electrodeposition or galvano-technical operation) is essentially the application of metallic layers to a metallic or other conductive surface using an electrochemical process, i.e., by passing a positively charged electric current through a solution containing dissolved metal ions (anode) and a negatively charged electric current through the part to be plated (cathode). Plating metal can be transferred onto either conductive (metal) surfaces or non-conductive (plastics, wood, leather) surfaces. The latter need to be made conductive by processes such as graphite coating, conductive lacquer, electroless plate or a vaporized coating. It is currently widely used in the automotive, airline, consumer electronics, jewelry, and toy industries. The external circuit, which consists of a source of direct current, a medium to convey this current to the plating tank, and a means of regulating the voltage and current at their appropriate values. The negative electrodes or cathodes – i.e., the material to be plated (the “workpiece”) – along with means to place it in the plating solution so that contact is made with the current. The plating solution itself, almost always aqueous (aka the “bath”). The positive electrodes, the anodes – usually the metal used for plating but sometimes a conducting material that serves merely to complete the circuit (“inert” or “insoluble anodes”). The plating solution is contained in a tank, which must be made of a material appropriate for the solution – often steel tanks with rubber, plastic, glass or lead linings, or plastic tanks. Degreasing: achieved by fat-dissolving chemicals (mostly an aqueous saline solution with surfactants) or by an electrolytic process. Both processes clean off fats and oxides from the surface. In the latter, the electrochemical reaction produces hydrogen and oxygen. Pickling: the workpiece passes through baths that allow cleaning of the surface as well as removal of oxide layers. The selection of an acidic or alkaline solution for pickling is usually determined by the base material. Physical cleaning: a pre-treatment that removes contaminants by mechanical energy, e.g., polishing, blasting, grinding, brush abrasion or ultrasonic agitation. It is less commonly used than degreasing or pickling. The next step in the electroplating process sees an electrolytic cell used to generate an electric current. This triggers ions from the coating metal to be deposited on the workpiece, creating an even metal layer. The longer the workpiece is in the bath and the higher the current, the thicker the layer of metal applied. Depending on the desired outcome, a wide variety of metals can be used – e.g., zinc for a protective coating; copper, nickel, chromium, zinc and tin for decorative coating; gold, silver, platinum, tin, lead ruthenium, rhodium, palladium, osmium and iridium for functional coating. The electroplating process is often followed by a post-treatment, which can be a mechanical process – such as greasing, oiling, electrostatic oiling, etc., or a chemical process, such as electroless chromating. Given the materials, processes and conditions involved, it comes as no surprise that electroplating carries not insignificant risks to people, property and the environment. Accumulation of flammable or explosive substances like solvent-based degreasers or lubricants. Use of combustible materials, e.g., for polishing; packaging material, plastic trays and tanks, plastic- or rubber-lined tanks with electric immersion heaters; plastic extraction hoods and ducts. Release of hydrogen during the plating process, which can create a dangerous explosive atmosphere. Combustible building materials – such as sandwich panels in external walls and roofs and insufficient fire resistance in supporting structures. Missing or insufficient structural fire-resistant separation (e.g., fire break wall) between production and adjacent areas (e.g., warehouses), or inadequate protection of the necessary openings in such walls. Lack of, or inadequate, fire detection and firefighting systems causing delays that render effective firefighting impossible. Dangerous conditions caused by chemicals and electrical currents which can severely hamper firefighting efforts (e.g., reactions when solutions come in contact with extinguishing water; hazards caused by electrical energy (especially from direct current); the enormous quantities of extinguishing water and foam concentrate necessary). Of course, where there’s fire there is also smoke, and smoke from galvano-technical plants can be particularly aggressive, causing considerable contamination and corrosion. Process baths contaminated by smoke and/or fire extinguishing water can, for example, become unusable, contributing further to business interruption woes and loss costs. Beyond processing facilities, flue gasses can cause damage in neighboring areas not directly affected by the fire. Additional environmental damage may also be caused by the discharge of industrial effluent containing toxic chemical solutions into sewers and water courses. Finding reliable results concerning fire losses at electroplating facilities is difficult. Even the statistics from the German Insurance Association (GDV) must be read carefully as, in businesses where electroplating is carried out as an auxiliary process, resulting losses are not consistently recorded as stemming specifically from the electroplating activities. According to the GDV internal working group, in Germany alone, at least 70 to 80 fires occur every year in galvano-technical plants.1 Of these, 10 to 15 can be categorized as major losses exceeding 500,000 Euros. The main causes (around 70%) are overheating of heating rods or electrical malfunctions, leading to a loss amount of more than 90% of the total loss of all cases investigated. Further analysis reveals that in almost 40% of the losses investigated, missing or defective safety devices for automatic shutdown and/or liquid level monitoring were decisive factors. Such damages often occur in off-peak periods, during the warm-up phase, or at times when only a few or no workers are present. Regarding business interruption, the GDV reports that it takes an average of 24 months to restart operations and return to pre-loss event production levels. Reconstruction restrictions imposed by local public authorities can be another factor preventing business being resumed quickly. 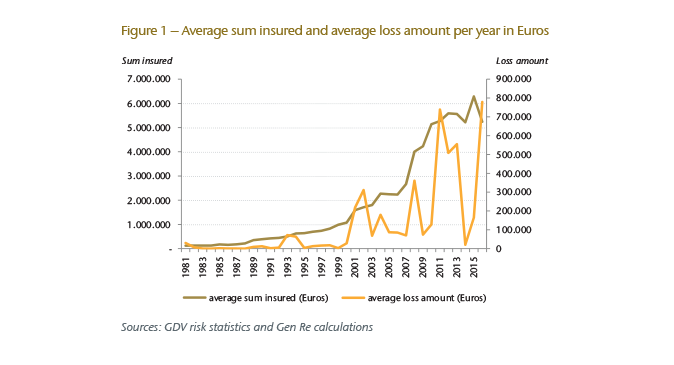 Looking at average sums insured and average loss amounts, the official statistics of the GDV for commercial risk show some volatility on the loss side (see Figure 1). As a consequence, the burning costs and loss probability fluctuate significantly (see Figure 2). Given the significant losses experienced by the electroplating industry in recent years, many insurers have, quite rightly, started to take a closer look at this occupancy, publishing fire prevention guidelines and updating terms and conditions accordingly. We hope our Electroplating Fire Protection Checklist will provide a useful reference point for insurance professionals undertaking or reviewing this process currently. The underwriting and pricing of electroplating/galvano-technical risks should always be based on a current audit report from an insurance engineer. Site audits should be conducted at regular intervals and any defects discovered remedied promptly and thoroughly. Any follow-up implementation should also be reported on. Plating operations may be stand-alone businesses, usually small to medium in size with sums insured often between USD10 million and USD100 million. Or, the activity may be part of a larger industrial operation; e.g., aircraft, electronics and jewelry manufacturing, leading to a higher hazard for that business segment. 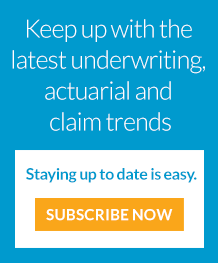 Regular checking and updating of sums insured is essential. In the event of losses, it often turns out that the sums insured were underestimated, particularly for property damage and business interruption. 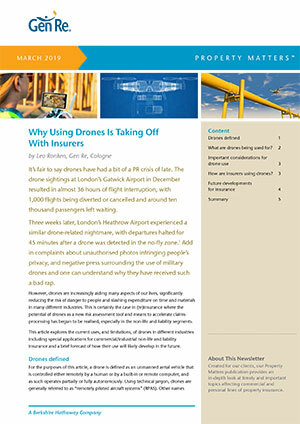 Business interruption risk should not be viewed as an appendix to Property insurance but reviewed independently (for both underwriting and pricing). The inability to move to a new site and long delivery times for replacement equipment can make the time needed to get operations back up and running far greater than expected (often more than 18 months). Following a fire, additional restrictions imposed by local authorities, including denial of access, can also add to business interruption and subsequent loss of key customers to competitors. Coverage extensions such as firefighting expenses, debris removal, decontamination costs, penalties, public authority clauses, extra expenses, increased cost of working (ICOW) and additional increased cost of working (AICOW), can further inflate potential claims. Additional exposure may arise from provisions such as machinery breakdown, third-party liability and environmental impairment. Understanding the full scope of cover is critical to avoiding nasty surprises further down the line. Losses in electroplating companies tend to be large, in most cases the Maximum Foreseeable Loss is expected to be 100%. If NatCat perils are insured, special attention to the electroplating exposure and coverage for such peril may be appropriate due to the nature of the processing activity; e.g., breakage/leakage of tanks, tubes leading to contamination of sites and the environment. Electroplating is an industrial process that poses some significant hazards. As well as sites where electroplating is the main activity, it is often a secondary process within larger operations, making it present in a substantial number of occupancy/business classes. 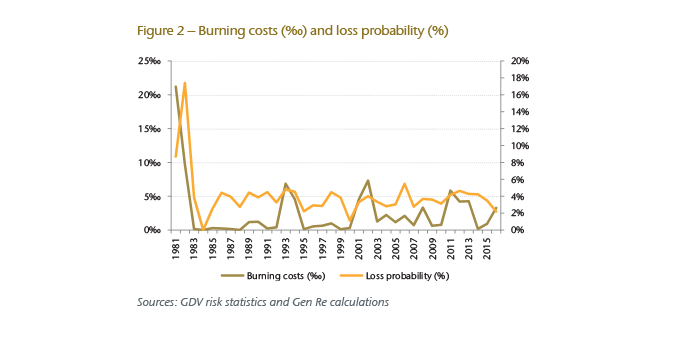 According to GDV findings, losses tend to be large with defective heating and electrical installations (often corroded by the electroplating solutions) the main cause of fires. Preventive measures, such as sprinklers, non-combustible construction materials, automatic fire alarm systems, separate fire break areas and regular maintenance, can significantly reduce losses. Following a fire, it can often take up to two years to reach pre-event levels of productivity, with key clients being lost to competitors in that time. The impact of business interruption should therefore not be misjudged. In summary, the underwriting of companies undertaking electroplating as part of their operations can be more complex than expected and close attention is needed to secure the profitability in this business segment. Get in touch with your Gen Re account executive if you would like to get expert advice on this underestimated exposure. Download PDF Version for our Electroplating Fire Protection Checklist, Further Reading and Endnotes.